This is the Web Page of the Davidson College Chapter of SPS. The above picture is of our SPS Chapter at PhysCon 2016 in San Francisco, CA. !6 students (one was an AZC) and 3 faculty attended. For 2015-2016 events click here. For 2014-2015 events click here. For 2013-2014 events click here. For 2012-2013 events click here. For 2011-2012 events click here. For 2010-2011 events click here. February 4: First Annual Hackathon at Davidson. SPS members volunteered and participanted. Hannah, Nancy, Ella, and Collin won the overall award! January 30: First SPS Meeting of the spring semester with pizza. January 25: SPS booth at the Davidson Activities Fair. January 23: Officially began mentoring program. January 19: PhysCon 2016 Seminar. Join us for a seminar presented by the 15 students who attended PhysCon 2016. January 13-15: Conference for Undergraduate Women in Physics, Virginia Tech University and Jefferson Lab. 3 students and 1 faculty member attended the conference. September 10-January 1: Annual SPS Fantasy Football Challenge. 12 students and faculty entered; Tan Phan won (again). December 6: SPS End-of-the-semester student research presentations. December 5: SPS End-of-the-semester Meeting with pizza. December 3: SPS Outstanding Chapter Award. November2-6: PhysCon 2016. 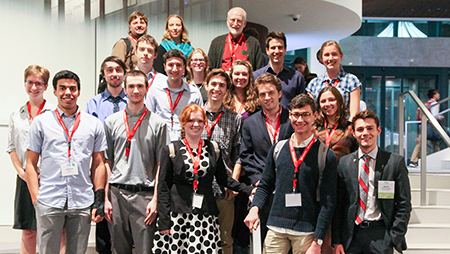 We have 16 students and 3 faculty attend the 2016 Quadrennial Physics Congress in San Francisco, CA. This was supported by a Clark Ross Davidson Research Initiative (DRI) Group Investigation Grant. October 31: Haunted Dana Science Building and Party. We had a great Halloween party and set up boo bubbles, Jacob’s ladder, Wimshurst machine, Van de Graaff, and other "spooky" apparatus. This year's theme was Star Wars. October 21: Stargazing at Fisher Farms. Our largest annual event, over 300 attendees viewed the stars, galaxies, and star clusters. October 15: Kickball Tournament, 2-5 pm. The "fall classic" involved mostly physics at our STEM kickball tournament with Math, Chemistry, and (hopefully) Biology, located across Ridge Road from the Golf Course. October 15: Society of Physics Students at a Davidson Football Game. We had several students and faculty on the field for academic appreciation day. October 17: Public lecture and dinner with Dr. Naomi Halas as part of the Smith Lecture. Also meeting with the Women in Physics group. October 12: Society of Physics Students Meeting. We had a PhysCon themed meeting to prepare for the big trip. September 29: Stargazing on Chamber's Lawn. Local event, over 100 attendees viewed the stars, galaxies, and star clusters. September 26-October 22: SPS GRE Prep. Join us and faculty for GRE prep sessions, in classical, modern, quantum, E&M, and stat/therm. September 2: Vermonster Challenge for MS. Our bellies were willing and this year we did it. We had two teams and Team 1 won! Team 2 was content in just eating the ice ream at a reasonable pace. September 6: First SPS Meeting of the semester. Join us to discuss events this semester and learn about the Society of Physics Students and Sigma Pi Sigma. August 26: Second Annual SPS Ice Cream Social. Over 60 SPS and prospective physics majors attended. We made liquid nitrogen (experimental) ice cream as well as traditional store bought (theoretical/computational) ice cream. August 24: Davidson College Activities Fair from 5:30-7:30 p.m., on Chambers Lawn. This is a super opportunity to connect with new students as well as upper-class students about SPS. July 5: Summer SPS Picnic for research students and faculty. June 14: Submitted 2015-2016 Chapter Report. May 1: Nikos Dokmetzoglou ran for Associate Zone Councilor for SPS Zone 5. Nikos was elected the 2016-2107 Associate Zone Councilor for SPS Zone 5.